What is a Static Group and how do I use one? Static Groups are a fixed collection of individuals, organisations or deals. Use these for the occasion that you would like to keep them in one place as a fixed point of reference. This could be a calling list, emailing list, a report or a forecast - the possibilities are endless. There are a number of ways you can add records into a static group. 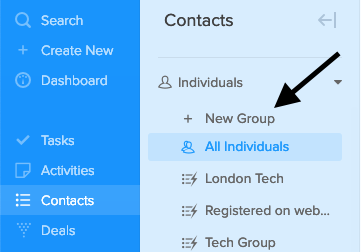 To create a static group, go to the record type that you would like (individuals, organisation or deals) and then click on "+ New Group". Manually adding them one by one. To do this click on the 'Add' button on the right of the screen. From here you can add individuals one-by-one. To do this you will need to create a smart group with filter parameters configured so that the individuals you wish to join are included (as above), now rather than saving them as a fixed group you can have individuals who match the criteria in the future be added to the static group. To do this you need to create an automation (go to Leads > Automations) and create an automation that will add anyone who joins the smart group in the static group. See automations for more info. Say you buy a list of contacts that you wish to import and you wish to include these into a group. When importing them you have the option to include a 'group' column. When mapping this, it will bring everyone who has a group name added to that column into a group with that name (SalesSeek will create a group if it doesn't already exist - thanks, SalesSeek!) this will then show on the record in the 'group section' and in the 'groups column' in the contacts or deals.